Paranormal gets a Stephen King makeover: An oracle in a small-town Florida uses her troubling gift to stop a murderer—before he comes for her. Aria Morse is an Oracle, blessed—or cursed—with the gift of prophecy. Ask her anything, and the truth spills out immediately. But Aria’s answers sound like nonsense, even to herself . . . just as they did to those at Delphi 2,500 years ago. To cope, Aria has perfected the art of hiding in plain sight—until Jade Price, the closest person she has to a friend, disappears. All of a sudden, everyone around her has questions. The “nonsense” Aria spouts becomes a matter of life and death. Aria may be the only one who can find out what happened to Jade. But the closer she gets to the truth, the closer she comes to being the next target of someone else who hides in plain sight. Someone with a very dark plan. "[T]he writing and the character development are top notch . . . Pauley writes with humor but also manages to maintain suspense. And readers will enjoy getting a look at rural Florida—which is far different from the Disney World and beaches that most readers know." "The concept behind Ask Me is without a doubt one of the best I've read... phenomenal." "Startling, sometimes painful . . . absorbing and resonant." "The best books keep their readers on a knife's edge of uncertainty, racing through the pages for resolutions. Kimberly Pauley has created a perfectly balanced, cutting masterpiece with Ask Me. Rest up before you begin, because you won't sleep easily when you're finished." 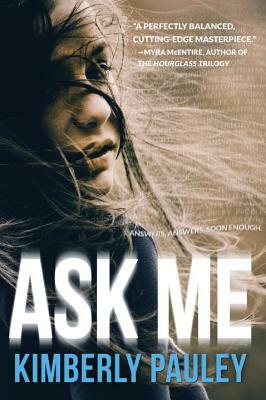 "Cryptic, dark, and delicious, Ask Me is the perfect pick for teens on the Stephen King track. Pauley has brilliantly crafted a paranormal thriller grounded in myth and twisted with the insecurity and hope every loner has felt. I'm staying out of the Florida woods forever." "Prepare to lose sleep . . . Kimberly Pauley’s Ask Me is a pulse-pounding thriller that left me guessing until the very end." "If you ask me, Pauley's new book explores one of the most original ideas I've seen in a long time." "Original, atmospheric, and utterly compelling. I couldn't put it down." "A suspenseful, surprising novel from start to finish." "A suspenseful blend of modern day thriller and ancient myth, perfect for all lovers of a good murder mystery—teens and adults alike." "Ask Me uses pitch-perfect prose to plunge the reader into a stunning and imaginative world filled with memorable moments, riveting action, and unforgettable characters. Well done."